Ever heard of the old expression of the grazing dog? Well, neither have we, but as every pooch parent can attest to; we’ve seen it. This is strange, yet normal behaviour for any four legged friend. But it usually leaves us worried and with a lot of questions. Are they hungry? Are they sick? Or is this simply a weird way to pass the time? And if so, can they be harmed and should I stop the behaviour? Younger dogs and little pups often eat grass as a form of play. Because younger dogs have so much energy they can easily become bored (by no fault of their doggie parents), and the most accessible “toy” is to keep themselves entertained is their own backyard. 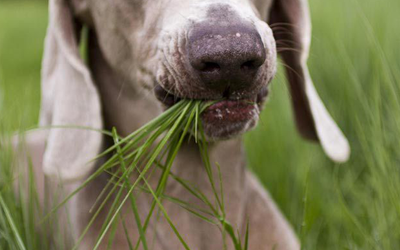 Some pets eat grass to improve their digestion. It’s even believed that some pets eat grass in order to treat intestinal worms. In certain cases, the “grazing” is caused by a nutrient deficiency. Although it’s nothing serious, the issue needs to be addressed. In the case of a nutrient deficiency, it usually means that your pet is not getting enough fibre in their diet. So should you stop the behaviour? There’s no reason for a panic attack if you ever spot your pooch taking a grassy nibble, but if you know your dog has such tendencies it’s important to be very aware of the condition of your garden and lawn. Make sure that there are no pesticides present and gather some knowledge of and remove any possibly poisonous plants. Information such as this can be found on the websites of organizations such as the SPCA. Although “grazing” is not really a threat to your pet’s health, it might be a symptom of an underlying issue as mentioned above. In the case of a younger dog, it’s worth a little extra effort by tossing a Frisbee or buying a chew toy. In the case of nutrition, it is advised that you switch to a different brand of dog food. If you are unsure as to what the ideal nutrition value of your pets diets should be, please contact us to find out what the nutrition guidelines for your specific pooch is depending on their age, breed and behaviour.